This hunter's style eight day musical German cuckoo clock features wooden hands, a wood dial with Roman numerals, and a warm light yellow hand-painted and hand-carved cuckoo bird. 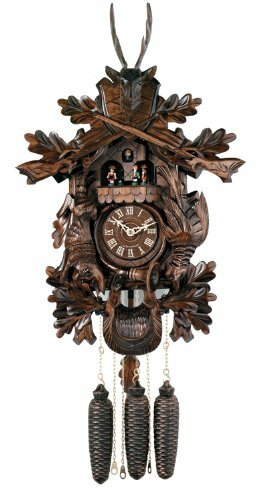 This cuckoo clock case features several hand-carved oak leaves, a hare and a bird hanging upside-down, and a buck at the peak of the clock above two crossed rifles. The dancers revolve on their platform at the top of every hour. This clock also plays music on the hour alternating between two different melodies: Edelweiss and The Happy Wanderer. Three cast iron pine cone weights are suspended beneath the clock case by three separate brass chains. On every hour the cuckoo bird emerges from a swinging door above the clock dial and counts the hour by cuckooing once per hour. (Example: At one o'clock the bird will cuckoo once. At eight o'clock the bird will cuckoo eight times) The half hour is announced with one cuckoo call. There is a sound shut-off device beneath the base of the cuckoo clock. Pushing the lever up disables the cuckoo birds cuckoo and the music. Pulling the lever down enables the cuckoo clock to play the music and cuckoo call. The eight day brass mechanical Regula movement is wound once per eight days by raising the three pine cone weights. One weight powers the time, one weight powers the music and dancers, and the other weight powers the cuckoo bird and cuckoo call. Great effort has been made to portray each cuckoo clock as accurately as possible. As with many handmade items, the exact coloration and carving may vary slightly from clock to clock. We consider this to be a special part of their character. This clock is covered by a two year limited warranty covering workmanship and manufacturers defects. If you have any questions about this product by River City Clocks, contact us by completing and submitting the form below. If you are looking for a specif part number, please include it with your message.